This is a 4-year Bachelor in Management Science and Information Management programme which combines Business Education, General Education, and Specialty Studies in Management Science and Information Management. This programme is offered by the Department of Supply Chain and Information Management. Graduates will be able to integrate information technology and management science concepts and tools with managerial skills appropriately and effectively resulting in supporting complex business analysis and operations. They can grasp the opportunities in the fast-changing business world, especially when making management decisions and applying their proficiency in cutting-edge information technologies to improve current business situations or to start a new business. This Programme aims to recruit students who have strong analytical ability, quantitative skills, programming interests, good communication skills and those who want to pursue a career in Business and/or IT after graduation. No prior IT knowledge nor business knowledge is required. Where necessary, admission interview will be arranged for selective applicants. If applicants are invited for interview, they are required to attend according to the scheduled time and date. Lower priority will be given to those applicants who fail to do so. Interview will be conducted during the period from May to July 2019. Selective applicants will be notified of the details via email. BMSIM programme adopts a Best Five Subject policy with English and Mathematics inclusive. The admission score is calculated based upon the summation of the weighted score of five subjects obtained from the Best Five policy, under which the best five subjects are selected based upon their corresponding weighted scores. For students with the same admission scores, consideration will be made on the basis of other available information including the band choice, interview performance, etc. *Remarks: Applicants must fulfill programme’s minimum entrance requirement (i.e. Core 5 excl. M1/M2: 33222). The following table shows the minimum level of various DSE subjects and the corresponding weights that are assigned to the subjects for the calculation of their weighted scores. 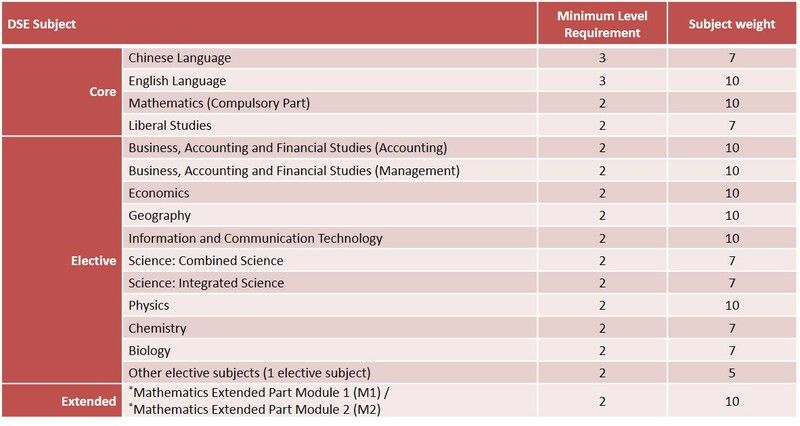 M1/M2 is considered as an elective subject in the 2019-20 admission score calculation. The following table also reveals that the subject weights are categorized into three levels of subject weight 10, 7 and 5. *M1/M2 is counted as an individual elective subject. The following table demonstrates an example of admission calculation under our scoring scheme for an applicant who obtained the following HKDSE results. The weighted score of individual subjects is calculated by the formula of converted DSE level (Y1) times the corresponding subject weight (Y2), i.e., Y1 x Y2. As the table shows, the Best Five subjects in terms of the five highest weighted scores are English, Mathematics, Liberal Studies, BAFS, and Geography. Their weighted scores are then summated to form the Admission Score that is used for admission consideration.